Goal: Achieve a better society through better communication. Much to my surprise, I've become something of a vim adherent, enough to want my own themes to suit my preferences. Decided to kill two birds with one stone and make a productivity app for myself while learning a newer framework. Extensible interface for demonstrating graph theory fundamentals. Pong clone in JQM that supports touch. Through the use of Duolingo, textbooks, online tutoring, and immersion, I hope to bring my skills up to a level for day to day communication with native speakers and to read technical papers written in German. Everybody’s got a story! I’d say that’s a good thing. And most stories have their interesting points, ups and downs, lessons to be learned. But not every story can be told, and certainly not every story can be known. It’s not a bad thing to be honest about this superfluence: some stories will help you more than others. Some stories have useful knowledge to impart, wisdom particular to your situation, insights or experience that match your needs; the teller may have a way of explaining that matches your learning style. But we also don’t always recognize the stories that are best for us: in fact, some of the best stories — those which transform us for the better — are generally impossible to recognize in advance, for only in our transformed state can we look back and see the growth for what it was. The challenge thus becomes identifying those important stories. In order to be receptive to stories possessing unexpected benefits, we need to remain open to stories that look like they fit poorly, but which may fit us well indeed. Unfortunately, actually unfitting stories also look unfitting. The more stories you hear, the more you glean the messages from different tellings and different backgrounds, the more quickly you’ll be able to identify the stories that fit you — or, more pertinently, pick out those that don’t. If this all sounds a bit unhealthy, note that the ability to recognize pertinent lessons does not itself constitute an excuse to rudeness; quite the opposite. The challenge of preserving our humanity, our spirit, and our openness to the heartfelt stories of others throughout our own growth is one of the most fundamental stories of them all. Learn, grow, seek, and preserve. Software changes the world. That’s the line. That’s the rule. That’s the reason we get into technology, to a large extent. We’re actively making the world a better place. Then why can it be so difficult to feel? If someone asks us, or if we take a step back and think broadly about our work, most in the field of technology will maintain — with varying degrees of enthusiasm — that the work we do improves the world in a real and measurable way. But in the unavoidable day-to-day drudgery, it’s often beyond us to maintain that perspective. The optimism gets lost in the morass. The goals get buried in the challenges. Sure, we celebrate our victories, when we launch a new product, or seal a contract, or get positive feedback from investors or customers. But then we go back to the “real world” and subsume ourselves in confounding challenges and in the inexorable mundane. Is that ok? 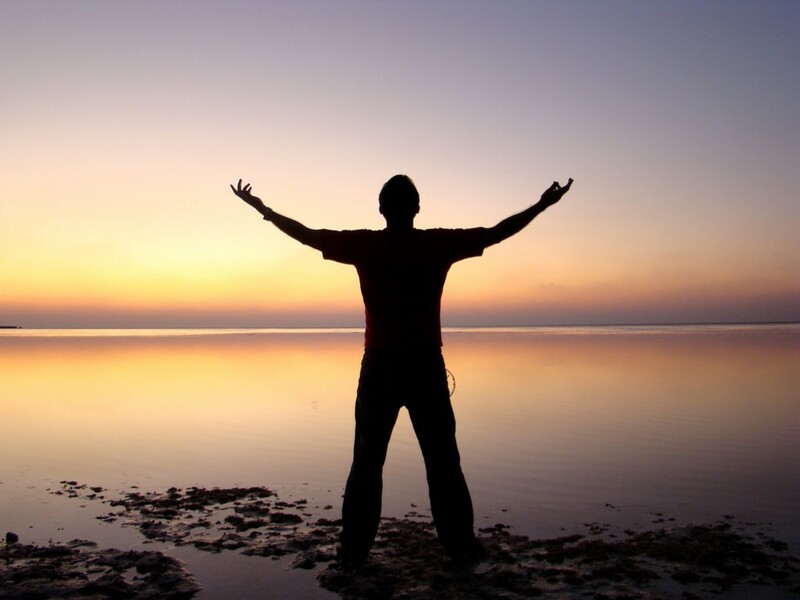 It isn’t to me: passion is at the root of much success, and for technology, that goes double, in my mind. Lose the passion, lose the promise. A positive future requires unfaltering persistence. Yet undeniably our work — any work — is born from the mundane. Edge cases, rigorous testing, real-world scenarios and limitations, unpredictable accidents, legal impediments, security concerns: the list of boundaries is not a short one. Solving these problems to get to a practical solution requires patience and a certain amount of drudge work. It may seem a bit depressing that all of our wonderful successes should become dimmed by lackluster toil. If it does seem that way, it means you’re thinking about it all wrong. Rather than the drudgery denigrating the previously supernal, allow the supernal to elevate the mundane. Keep track of your successes, even the small ones, and be cognizant, even verbally so, of their role in the larger scheme. Take a moment to recognize the quality of your work, even if it’s merely one cog in a large machine. If you spend an entire month building and testing security for a single data submission form, no doubt it will get a bit annoying, even boring. Checking and double checking all the possible entry points and potential attack vectors is nobody’s first choice. But it is good work, and doing a good job on that is no laughing matter. It’s ok to be simultaneously bored, annoyed, and also proud of what you’re doing. Even a brief moment in the course of your work can prove sufficient to rejuvenate your passion. You know why you started doing what you’re doing — the promise and potential were captivating, alluring. Well, captivate yourself all over again. Remind yourself of this every time you start to lose touch with why you do what you do. Of course, no strategy can entirely overcome the rote. Not every day will be a wonderment. Not every day needs to be. But each day can be a stepping stone, a mile marker, a valid and valuable increment towards your larger goal, and appreciable in its own merit. Your time was not wasted; you did good work and it’s going to a good purpose. Your day was valuable. Your work is valuable. Your software is changing the world. Sometimes it’s fun to poke around in odd bits of data and see what interesting information it’s possible to extract. All kinds of data sit out there in the open for the taking; data.gov is a favorite go-to of mine for playing around. Of course with any data, and especially openly distributed data, there comes to the chance that the data are malformed, missing fields, inconsistent, or easily misinterpreted. 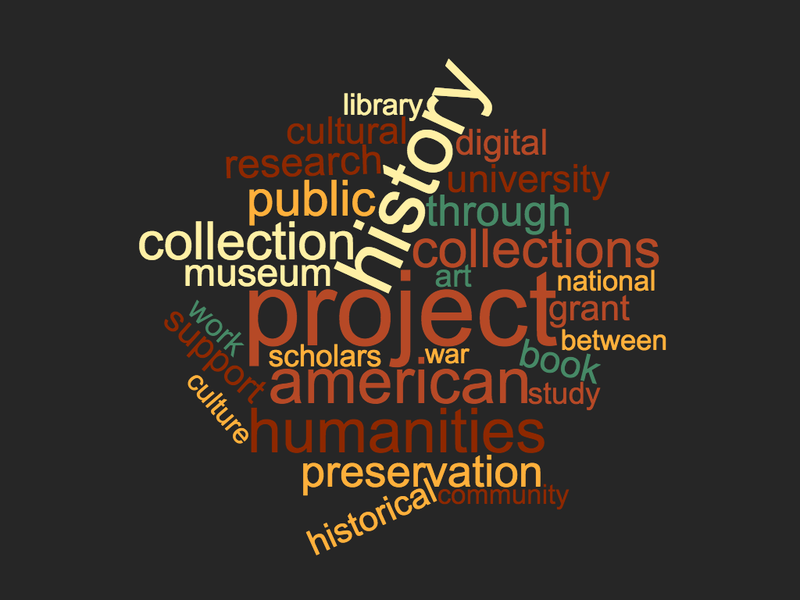 When I stumbled on the NEH grants dataset and started poking into their XML file for recent grants, I ran into and nearly missed an obvious issue within minutes. 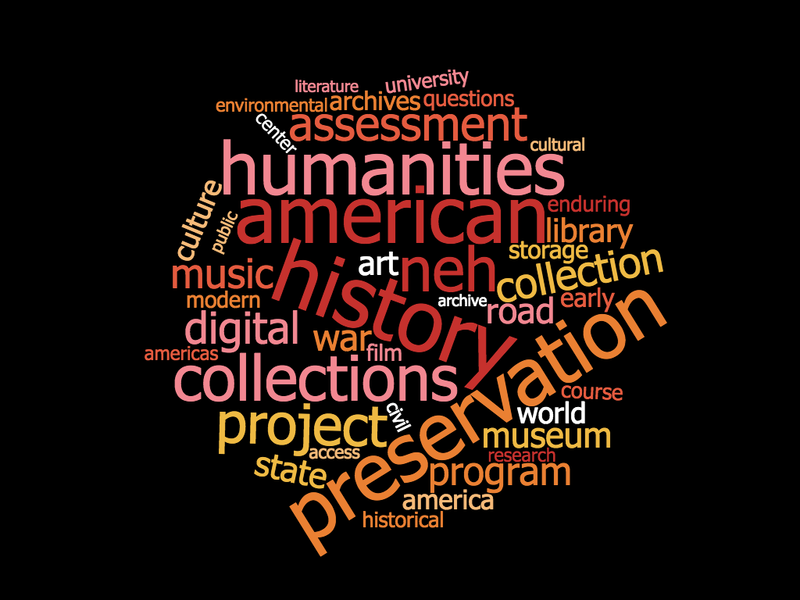 NEH releases its data by decade, though updated monthly, and so when you compute averages, you might not notice that your outcome gets skewed significantly by the absence of any data in the 2019 column as of October 2018 — for obvious reasons! After a bit more poking around, and a more careful attempt to understand the data for what it is, I came up with the following bits of information. The graph of the descriptions denotes an even stronger focus than in the titles. 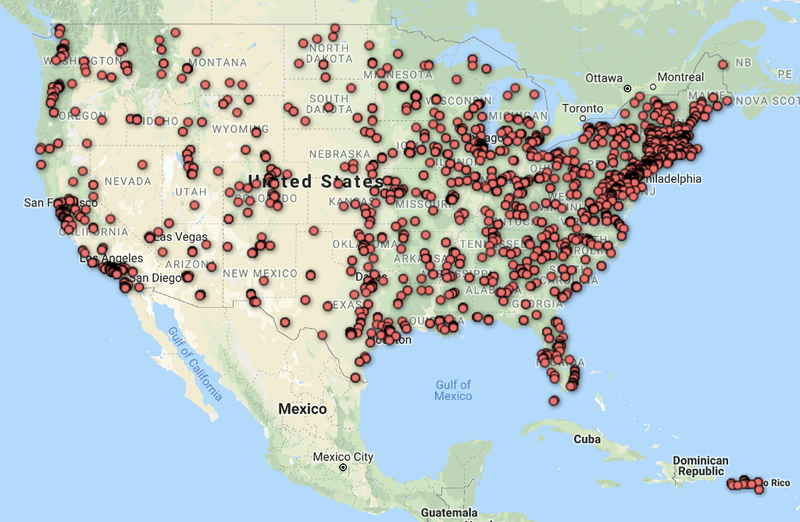 This map was created with Google Docs and FusionTables plugin, in case of interest. 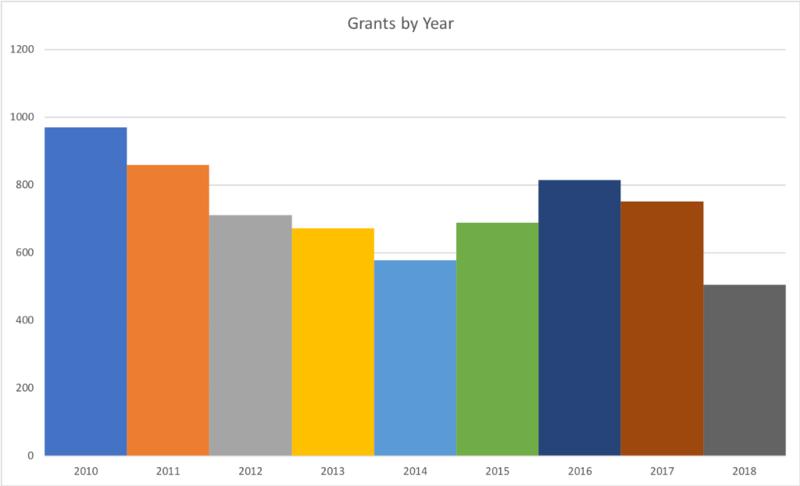 Finally, we can perform a simple breakdown of grants awarded by year. As 2018 has not yet closed at time of writing, the bar for that year should be taken with a grain of salt. Whether any of these findings extend to other decades, or to other types of grants and other agencies is hard to assume. 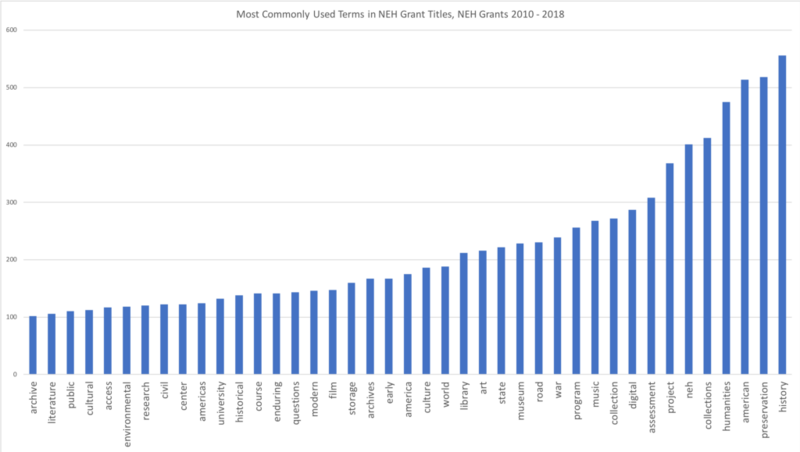 Obviously, some aspects of this data show high correlation to the purpose for which they were created — it’s natural for instance that many NEH-funded project proposals would include the term “history,” whereas NIH grants might have a very different focus. Yet it’s interesting to observe how certain terms cluster, and how grants are awarded, etc. There are always plenty of learning opportunities lurking in the piles of data, as long as you’re willing to put in the work — and not make too many assumptions!